On Sunday, August 26, the Honors Program was pleased to host over 260 first year students at its annual Fall Welcome Dinner at the Sheraton Syracuse hotel. Students sat with their HNR 100 sections and enjoyed conversations with their classmates, professor and TA. 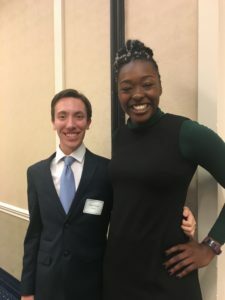 Several upperclassmen reflected on their experience in Honors, including Rob Blecher ’20, president of the Honors Advisory Board, Nathan Shearn ’19 and Santita Ebangwese ’19. Our favorite mascot, Otto, even made a surprise appearance! It was a great way to start off the academic year. ← Welcome and Advice for Honors First Year Students!